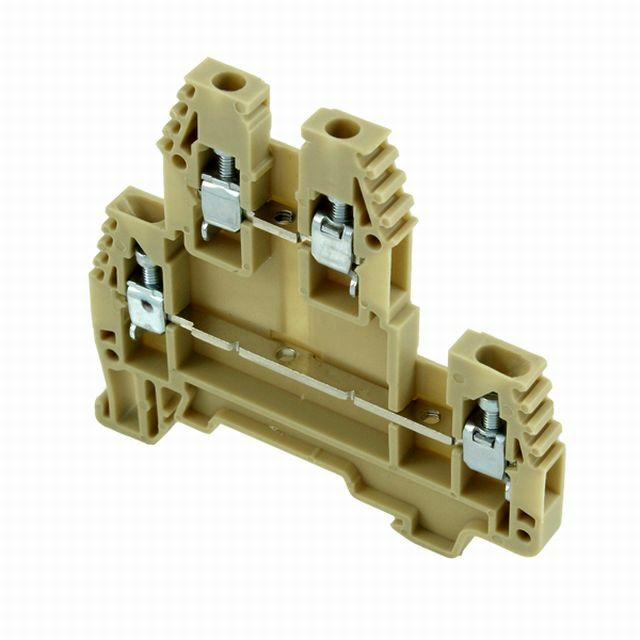 IMO Din Terminal Block, Double-Deck, 20 A, 300 V, 26-12 AWG, beige, 5 mm, 100 pieces. Engineering Thermoplastic Polyamide 6.6 has excellent electrical, mechanical and chemical characteristics even at temperatures as high as 100˚C and contain no cadmium based colour pigments. Polyamide 6.6 moulded housing absorbs humidity from its surroundings. This makes the plastic material elastic and fracture proof even at temperatures as low as -40˚C. Being a self extinguishing material it is difficult to ignite and burns only as long as there is a supporting flame. It is rated V2 according to UL94. Good aging resistance and insensitivity to ultraviolet light makes it suitable for tropical and open air applications.